Islamabad, Nov 26: Clashes today broke out here as security forces launched a crackdown on protesters belonging to hardline religious groups who were blocking a key highway to the capital, leaving one policeman dead and over 200 others injured and triggering violent demonstrations in other cities. The government ordered suspension of private TV channels and blocked popular social media sites as police and paramilitary personnel fought pitched battles with the activists of Tehreek-i-Khatm-i-Nabuwwat, Tehreek-i-Labaik Ya Rasool Allah (TLY) and Sunni Tehreek Pakistan (ST) who torched vehicles and attacked the houses of political leaders. However, the protesters regrouped agian and continued their siege of the capital that started about three weeks ago, demanding sacking of Law Minister Zahid Hamid for changes in a law related to the Khatm-i-Nabuwwat (finality of prohpethood) oath in the Elections Act 2017. They alleged the action undermined Islamic beliefs and linked it to blasphemy. The government already amended the law and restored the original oath but the hardline clerics refused to go away until the minister was sacked. The siege played havoc with the more than half million commuters who daily travel between Islamabad and Rawalpindi. The government was reluctant to use force, but launched operation after Islamabad High Court (IHC) yesterday issued contempt of court notice against interior minister Ahsan Iqbal for failing to implement orders to clear the roads. Islamabad city magistrate yesterday issued a warning to protesters to disperse by midnight or face consequences. More than 8,000 personnel of police and paramilitary Rangers and Frontier Constablary launched the crackdown to clear Faizabad interchange linking Islamabad with garrison city of Rawalpindi and the only international airport of the capital. In the morning hours, it looked that the police would clear the roads but the protesters regrouped by mid-day to re-occupy the interchange bridge, forcing the authorities to suspend the operation temporarily. They also pelted stones on the security personnel who used batons and teargas shells to disperse them. According to health officials, more than 200 people, including at least 95 security personnel, were injured in the clashes and shifted to various hospital of the twin cities of Islamabad and Rawalpindi. At least one policeman reportedly died due head injury, but the government has so far not confirmed the death. Private media reported that two protesters also died in the clashes, but it could not be independently confirmed. TV footage showed police firing teargas shells and security personnel in riot gears charging at the protesters dozens of whom were arrested and shifted to various police stations. Protesters also burnt some vehicles and thrashed several policemen and other security personnel. Pakistan Electronic Media Regulatory Authority (PEMRA) ordered media houses to stop live coverage and temporarily suspended several channels, including Geo TV, for failing to follow the directive. Pakistan blocked popular social media site including Facebook, Twitter and YouTube to stop protesters from uploading their messages. 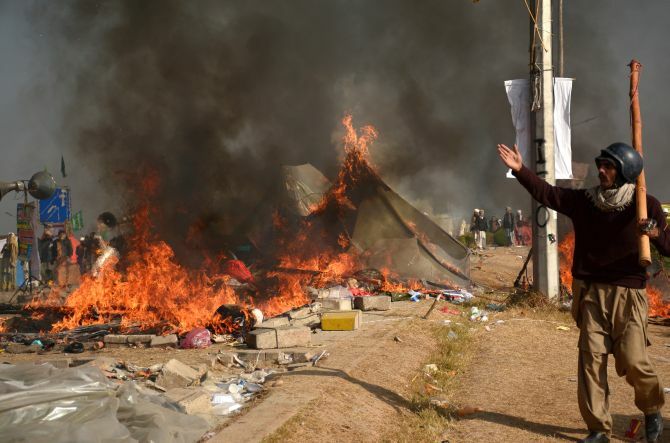 Violent protests were also reported from several other cities including Karachi and Lahore. In the commercial hub of Karachi, at least 28 people were injured, according to local police. Protesters attacked the house of federal law minister Zahid Hamid in Pasroor area of Sialkot district of Punjab but no one was injured as the minister and his family were not present inside. The rioters also attacked the house of former interior minister Nisar Ali Khan in Faizabad area of Rawalpindi. They damaged the gate of his house and tried to enter the premises, but were prevented by police. Mian Javed Latif, a lawmaker of ruling Pakistan Muslim League-Nawaz, was thrashed by protesters in Sheikhupura area of Punjab and was being treated for injuries in the local hospital. In the midst of challenging law and order situation, interior minister Ahsan Iqbal alleged involvement of Indian hand in the mischief and said protesters "contacted India" and the government was probing it. "Why they did it (contacted India), we are looking into it. They (protesters) have inside information and resources that are being used against the state," he said. Iqbal said government was implementing court's orders to disperse the protesters. "We are trying to clear the area with minimum violence, but we also need to ensure the fundamental rights of people of twin cities," he said. A military spokesman said that army chief General Qamar Caved Bajwa talked to Prime Minister Shahid Khaqan Abbasi on telephone and urged for peaceful solution to the problem. "COAS [chief of army staff] telephoned PM. Suggested to handle Islamabad Dharna (sit-in) peacefully avoiding violence from both sides as it is not in national interest and cohesion," said spokesman Major General Asif Ghafoor. Earlier, the IHC last Friday gave a 24-hour deadline to the government to clear the roads which was later extended till Thursday. However, the court yesterday expressed strong displeasure at government for failing to take action against protesters.